One of my favourite memories happened in Feb. 2008 at our Paralympic Trials between us and our Canadian training partners. It was day 3 of 5 days of racing and we were being towed in from the race course at the end of a great day of sailing by the Coach Boat. We were about ¾ the way in & our keel blew up!!! Once back to the marina we hauled our boat out of the water & realized that the keel was totally unfixable. After hours of unsuccessfully trying to utilize a keel from a different (but similar) boat, we realized that our dreams to compete in 2008 were fading away. The next day about 1 hour from the start time, a fellow Canadian sailor offered his boat to us & he would sit on the sidelines to watch our trials. Excited we went out & sailed our best set of races. In the end we did not win trials, but that was a favourite day because it showed me how resilient I can be when I put my mind to it; and more importantly it showed me what being a true sportsman was all about. My hat is off to my Canadian Sailing buddy who sacrificed his standings in the regatta for our hopes & dreams. Every person/athlete is given challenges; it is how they deal with those challenges that makes the person who they are. CAN Fund is an amazing organization. The information, energy & enthusiasm that is generated from this program helps all athletes. The funding I have received this year allows me to accelerate my training and competition schedule to a level that is needed to succeed in the top ranking of the World. Thank you so much!!!! Brenda brings to the team great problem-solving and organizational skills, a sense of humour and a passion for her sport of sailing combined with a keen desire to improve and succeed. She operates her own forestry consulting business, specializing in management planning to address sustainability issues and forest certification. 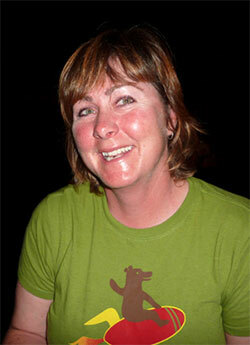 Enjoys Alpine Skiing, Cross Country Skiing, Cycling (Road & Mountain), Ice Hockey, Swimming, Yoga & Pilates.